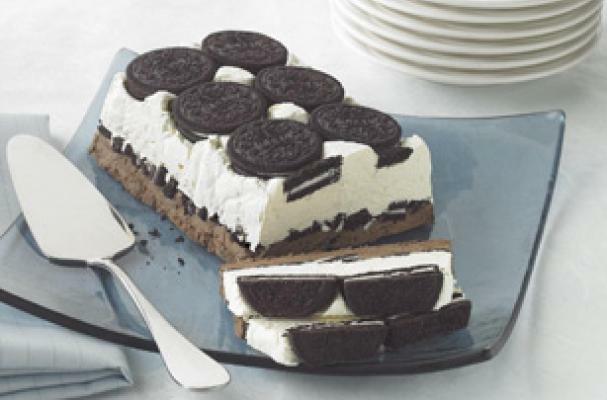 This cookies and cream cake is a cooling dessert fit from summer. While you might be tempted to pick up a cake from the grocery store or order one from your local bakery, this recipe is so simple that you won't have to. Not only is cheaper to make this cake yourself, it will also taste better because you made it. Kids and adults alike will devour this cookies and cream cake so you won't have to worry about leftovers hanging out in the fridge. And if there is a slice or two leftover, you can eat as a midnight snack. Line 8x4-inch loaf pan with foil, with ends of foil extending over sides. Cover bottom of pan with 8 cookies. Crumble remaining cookies. Beat cream cheese, sugar and vanilla in medium bowl with mixer until well blended. Stir in COOL WHIP. Spoon 1-1/2 cups cream cheese mixture into medium bowl; stir in melted chocolate. Spread remaining cream cheese mixture over cookies in pan. Sprinkle with crumbled cookies; press gently into cream cheese mixture with back of spoon. Top with chocolate mixture. Freeze 3 hours or until firm. Remove dessert from freezer 15 min. before serving; invert onto plate. Discard foil. Let dessert stand at room temperature to soften slightly before cutting to serve.